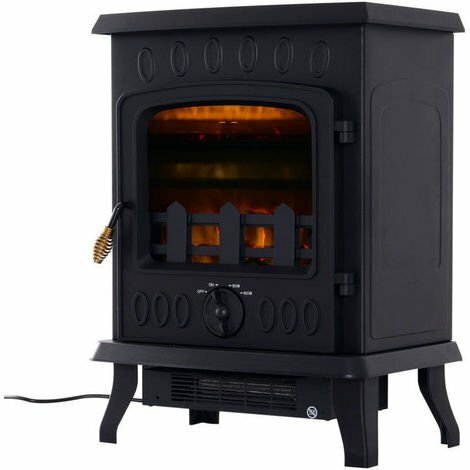 Warm your room in minutes with the Freestanding Electric Fireplace from HOMCOM. It comes with amazing flame effect in LED lighting, which can be used independently or together with the heater. 2 heat settings (900W/1800W) and adjustable thermostat control can be easily operated via those switches on the back to provide optimal comfort. The fireplace comes with a overheating thermal cut off for your safety and wellbeing. Gentle burning flame effect in cast metal housing, this fireplace is an elegant yet functional addition to your home, office, hotel, cafe or bar. this could cause overheating and risk of fire. Our brand stands for everything you need for your home. Whether it is furniture, appliance or simply the right lamp to match your décor. Your office can be spiced up with our new line of office furniture and comfortable chairs, or upgrade your kitchen with our portable carts. Beautiful leather chairs, portable furniture, and decorative accessories are our core speciality.